شکوهی, رضا, علیخانی, محمد یوسف, کاشی تراش اصفهانی, زهرا. (1395). جداسازی و شناسایی میکروارگانیسم‌های گوگردخوار از لجن تصفیه‌خانه فاضلاب پالایشگاه نفت تهران. مجله آب و فاضلاب, 27(4), 56-61. رضا شکوهی; محمد یوسف علیخانی; زهرا کاشی تراش اصفهانی. "جداسازی و شناسایی میکروارگانیسم‌های گوگردخوار از لجن تصفیه‌خانه فاضلاب پالایشگاه نفت تهران". مجله آب و فاضلاب, 27, 4, 1395, 56-61. شکوهی, رضا, علیخانی, محمد یوسف, کاشی تراش اصفهانی, زهرا. (1395). 'جداسازی و شناسایی میکروارگانیسم‌های گوگردخوار از لجن تصفیه‌خانه فاضلاب پالایشگاه نفت تهران', مجله آب و فاضلاب, 27(4), pp. 56-61. شکوهی, رضا, علیخانی, محمد یوسف, کاشی تراش اصفهانی, زهرا. جداسازی و شناسایی میکروارگانیسم‌های گوگردخوار از لجن تصفیه‌خانه فاضلاب پالایشگاه نفت تهران. مجله آب و فاضلاب, 1395; 27(4): 56-61. شناسایی میکروارگانیسم‌های گوگردخوار گام مهمی در گوگردزدایی میکربی ترکیبات آلی خصوصاً نفت است. گوگردزدایی میکربی از نظر اکولوژیک بی‌خطر و از نظر اقتصادی قابل توجیه است. لذا دستیابی به اطلاعاتی در مورد شناسایی، جداسازی و آداپتاسیون میکروارگانیسم‌های مورد نظر از جنبه‌های مختلف عملیاتی، اقتصادی و زیست محیطی از اهمیت زیادی برخوردار است. بدیهی است که نوع میکروارگانیسم‌های موجود با توجه به شرایط محیطی محل و خصوصیات نفت تغییر می‌کند و پیدا کردن این گونه‌ها در شرایط و وضعیت محل می‌تواند میزان کارایی میکرواگانیسم‌ها را افزایش دهد. هدف از انجام این پژوهش شناسایی و جداسازی باکتری‌های تجزیه‌کننده گوگرد از لجن بیولوژیکی تصفیه‌خانه فاضلاب پالایشگاه نفت تهران است. در این پژوهش کاربردی-توصیفی به‌مدت 12 ماه در هر ماه 10 نمونه از نقاط مختلف حوض ته‌نشینی در ارتفاعات و مساحت‌های مختلف برداشت شد و پس از به‌هم‌زدن و یکنواخت کردن به آزمایشگاه منتقل شد. سپس جداسازی باکتری‌های گوگردخوار از لجن تصفیه‌خانه فاضلاب پالایشگاه نفت تهران انجام شد. به‌منظور جداسازی میکروارگانیسم‌ها ابتدا نمونه‌ها در محیط‌های کشت اختصاصی و افتراقی کشت داده شد و پس از تشکیل و تکثیر کلنی‌ها با انجام آزمایش‌های متعدد، میکروارگانیسم‌ها شناسایی شدند. باکتری‌هایی که در این پژوهش شناسایی شدند، عبارت‌ند از: برواندیوموناس وسیکالاریس، آسینتوباکتر اس پی پی، کلستریدیوم اس پی پی، آلکالیجنس اس پی پی، اشیرشیاکلی، باسیلوس اس پی پی، کلبسیلا اس پی پی، آکروموباکتر اس پی پی، دی سیلفو ویبریو اس پی پی. همچنین سایر جنس‌هایی از خانواده بزرگ سودوموناس ایزوله شدند. با توجه به محیط کشت اختصاصی و شرایط اختصاصی به‌کار رفته در این پژوهش می‌توان نتیجه گرفت که تمامی باکتری‌های شناسایی شده، از گوگرد به‌عنوان تنها منبع انرژی استفاده کرده‌اند. دستاورد مهم دیگر این پژوهش در مورد توانایی برواندیوموناس وسیکالاریس به‌منظور تجزیه گوگرد است. این باکتری برای اولین بار به‌عنوان باکتری تجزیه کننده گوگرد در این پژوهش گزارش شده است و تاکنون گزارشی در این مورد ارائه نشده است. Identification of sulfur-degrading microorganisms is a major step in microbial desulfurization of organic compounds, especially oil. Microbial desulphurization is ecologically safe and economically justifiable; hence, the importance of knowledge on the identification, isolation, and adaptation of microorganisms from operational, economic, and environmental viewpoints. The objective of this descriptive‒applied research was to identify and isolate sulfur-degrading bacteria in the sludge from Tehran refinery wastewater treatment plant. For this purpose, 120 samples (10 samples per month over a 12‒month period) were collected from different locations and elevations of the sedimentation basin. The samples were then stirred and homogenized before they were transferred to the laboratory where they were cultured on specific and differential media to allow the microorganisms to grow. Finally, tests were performed and the following bacteria were identified in the samples: Brevundiomonas vesicularis, Acinetobacter spp, Clostridium spp, Alcaligenes spp, E.coli, Bacillus spp, Klebsiella spp, Acromobacter spp, and Desulfovibrio spp. Results indicate that all the bacteria identified in the samples used sulfur as their only source of energy. Another important contribution of this study is that Brevundiomonas vesicularis is for the first time identified in this study as a sulfur-degrading one. 1. Pawelec, B., Navarro, R., Campos-Martin, J., and Fierro, J. (2011). “Towards near zero-sulfur liquid fuels: A perspective review.” Catal. Sci. Technol., 1, 23-42. 2. Seeberger, A., and Jess, A. (2010). “Desulfurization of diesel oil by selective oxidation and extraction of sulphur compounds by ionic liquids: A contribution to a competitive process design.” Green Chem., 12, 602-608. 3. Nevers, N.D. (2000). Air pollution control engineering, McGraw-Hill, N.Y.
4. Public Health Service. (1996). The effects of air pollution, Division of Air Pollution, Washington, D.C.
5. Anisimov, A., and Tarakanova, A. (2009). “Oxidative desulfurization of hydrocarbon raw materials.” Russ. J. Gen. Chem., 79, 1264-1273. 6. Ismagilov, Z., Yashnik, S., Kerzhentsev, M., Parmon, V., Bourane, A., Al-Shahrani, F., et al. (2011). “Oxidative desulfurization of hydrocarbon fuels.” Catal Rev. Sci. Eng., 35, 199-255. 7. Ho, T. (2004). “Deep HDS of diesel fuel: Chemistry and catalysis.” Catal. Today, 98, 3-18. 8. Adschiri, T., Shibata, R., Sato, T., Watanabe, M., and Arai, K. (1998). “Catalytic hydrodesulphurization of dibenzothiophene through partial oxidation and a water-gas shift reaction in supercritical water.” Ind. Eng. Chem. Res., 37, 2634-2638. 9. Mehran, S., and Amarjeet, B. (2007). “Biodesulfurization of refractory organic sulphur compounds in fossil fuels.” Biotechnol. Adv., 25, 570-596. 10. Agarwal, P., and Sharma, D. (2010). “Comparative studies on the biodesulfurization of crude oil with other desulfurization techniques and deep desulfurization through integrated processes.” Energy Fuels, 24, 518-524. 11. Kirkwood, K., Ebert, S., Foght, J., and Fedorak, P. (2005). “Bacterial biodegradation of aliphatic sulfides under aerobic carbon- or sulfur-limited growth conditions.” Appl Microbiol., 99,1444-1454. 12. AWWA. (2012). Standard methods for the examination of water and wastewater, 22th Ed., USA. 14. Babu, G.P., Subramanyam, P., Sreenivasulu, B., and Paramageetham, C. (2014). “Isolation and identification of sulfate reducing bacterial strains indigenous to sulphur rich barite mines.” Int. J. Curr. Microbiol App Sci., 3(7),788-793. 15. Laleh, A., Amiri, S., Ebrahimipour, G., and Fakhary, J. (2012). “Desulfurizaion of dibenzothiophene by klebsiella oxytoca siolated form oil-cantaminated sail in southern ahva.” Environmental Sceinces, 9 (3), 27-40. 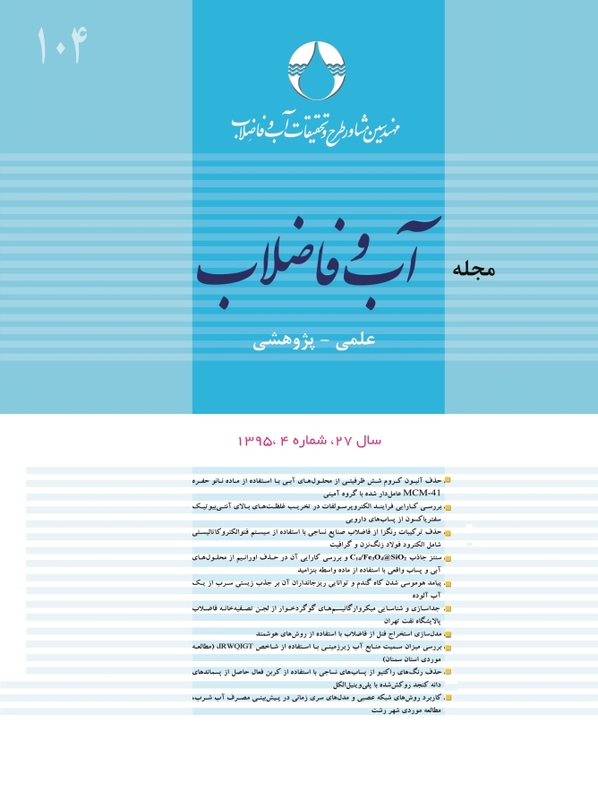 (In Persian). 16. Maria, C., Coaba, C., and Ver, K. (1991). Microbial examination of water and wastewater, Boca Raton, London. 17. Rath, K., Mishra, B., and Vuppu, S. (2012). “Biodegradingability of organo-sulphur compound of a newly isolated microbe Bacillus sp.” Applied Science Research, 4(1), 465-471. 18. Ranson, I., and Rivas, C. (2002). “Inventors; Biodesulfurization of hydrocarbons.” Google patentes Assignee. 19. McFarland, B. (1999). “Biodesulfurization.” Curr. Opin. Microbiol., 2, 257-264. 20. Kim, H., Kim, T., and Kim, B. (1990). “Degradation of organic compounds and the reduction of dibenzothiophene to biphenyl and hydrogen sulphide by desulfovibrio desulfuricans M6.” Biotechnol. Lett., 12, 761-764. 21. Kim, B., Kim, H., and Kim, T. (1995). “Selectivity of desulfurization activity of desulfovibrio desulfuricans M6 on different petroleum products.” Fuel Process Technol., 43, 87-94. 22. Lizama, H., Wilkins, L., and Scott, T. (1995). “Dibenzothiophene sulphur can serve as sole electron acceptor during growth by sulphatereducing bacteria.” Biotechnol. Lett., 17, 113-116. 23. Ohshiro, T., and Ishii, Y., (2005). “Dibenzothiophene desulfurizing enzymes from moderately thermophilic bacterium Bacillus subtilis WU-S2B: Purification, characterization and overexpression.” Journal of Bioscience and Bioengineering, 100(3), 266-273.